Three Friends Of Alleged Boston Bomber Plead Not Guilty : The Two-Way The three 19-year-olds are accused of misleading police or destroying evidence to help Dzhokhar Tsarnaev evade capture. 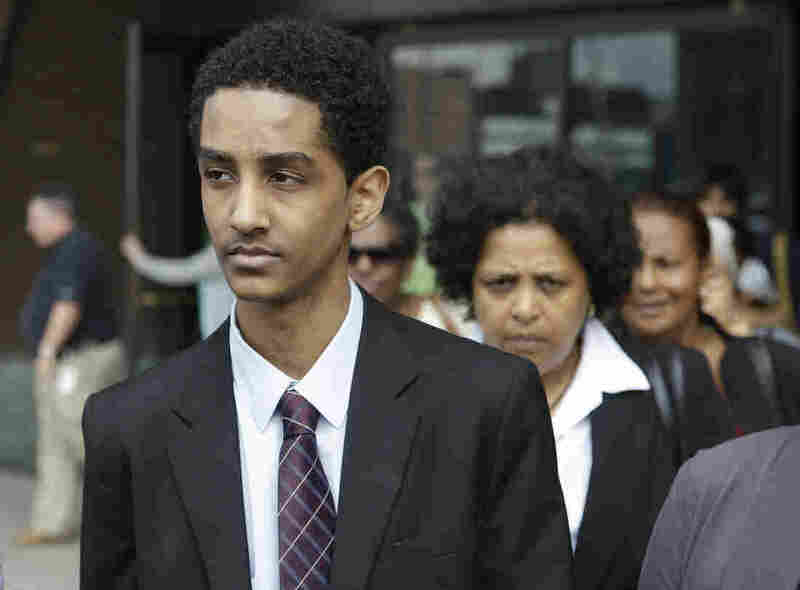 Robel Phillipos leaves federal court on Friday in Boston after he was arraigned on charges of hindering the investigation of Boston Marathon bombing suspect Dzhokhar Tsarnaev. The three friends of the alleged Boston bomber pleaded not guilty to charges that they misled police to help Dzhokhar Tsarnaev evade capture. The Boston Globe reports Dias Kadyrbayev and Azamat Tazhayakov, both 19, had been indicted and entered a not-guilty plea, but they had to repeat the process on Friday when Robel Phillipos, 19, was added to their indictment. Phillipos is accused of lying to police, while the other two former University of Massachusetts Dartmouth students face more serious charges of obstruction of justice. "Assistant US Attorney John A. Capin said he expects to call up to 20 witnesses in a trial, which could last two weeks. The case was continued to Oct. 29. "The charges against Phillipos relate to two occasions in April, five days apart, when federal agents allege that he lied about what he was doing in the hours after agents broadcast photos of the alleged suspects in the Marathon bombings. "The indictment handed up by the grand jury said Phillipos told numerous lies before acknowledging that he and the Kazakh students had entered Tsarnaev's dorm room on the evening of April 18 and removed several items, including Tsarnaev's laptop and a backpack containing fireworks and Vaseline, which they believed had something to do with making bombs." Reuters reports that Phillipos could face up to 16 years in prison, while Kadyrbayev and Tazhayakov could face 25 years in prison or deportation.